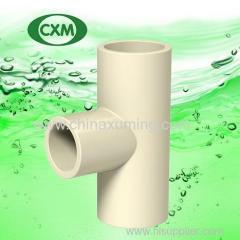 Chlorinated polyvinyl chloride (CPVC) is a unique polymer after polyvinyl chloride chlorination. Ordinary PVC molecular chlorine content is 45%, the chlorinated polyvinyl chloride molecules chlorine content is about 64% to 68%,up to more than 70%. CPVC tensile capacity is higher than the UPVC,PP,PP-B,PP-RH,PB,HDPE,PE,PE-X RT,etc; its thermal expansion coefficient is lower than the PP,PE,PB; thermal conductivity is lower than that of PP,PE,PB and metal pipe; the temperature resistance and resistance to deformation ability is better than that of PP,UPVC,ABS,HDPE. CPVC pipes are designed in copper tube size from 1/2" to 2", with two kind of standard dimensional ratios-SDR11 and SDR13.5. The fittings are designed with standard SDR11. SDR13.5 pipe match the standard ASTMF442. The specification of those products, which covers requirements, test methods, and methods of marking for components made in one standard dimension ratio and intended for water service, can match the standard ASTM D2846. The extremely low rate of harmful bacteria breeding is superior to drinking water hygiene standard designd by both the world health organization and the people's republic of china ministry of health. Thereby it was recommended for medical system. Limited oxygen index of CPVC material is 60%. The minimum ignition temperature is 482ºC. No dropping fire, very low smoke rate and no poisonous gas. CPVC material has strong resistance, which can be used for delivering liquid of HCL and NaOH. CPVC material has low coefficient of thermal expansion. Expansion loop length is 16 feet, under the condition of 100F temperature change and 20' holding. The ultraviolet rays will not cause breakage of polymer chains structure. CPVC materials has strong antioxidant and aging resistance performance than other material in utilization. Hot and cold water applications in homes, apartments, hotels, resorts, hospitals, high and low rising buildings, corporate and commercial houses, academic institutes etc. Piping networks for pure water and medicament in pharmaceurical factory. Piping networks for beverage, dairy and drinking water supply.